Our Solar System has three zones: the "terrestrial" zone is comprised of relatively small, solid bodies (Mercury, Venus, Earth, Mars), while the "giant planet" zone has behemoth worlds (Jupiter, Saturn, Uranus, Neptune) with swirling gas envelopes surrounding their cores. Only in the early 1990s did we discover the existence of a third zone, the Kuiper Belt, populated with icy dwarf planets and at least a hundred thousand objects larger than 50 miles across. The architecture of the Kuiper Belt (with "cold classical", "resonant", and "scattered" objects) has revolutionized our view of the Solar System's formation and evolution, suggesting a much more turbulent beginning than previously imagined. The New Horizons spacecraft made the first fly-by of Pluto on 2015 July 14, capturing a flood of data on this magnificent "mini solar system" comprised of the binary dwarf planets Pluto and Charon and the small moons Styx, Nix, Kerberos, and Hydra. Pluto has just been transformed from a pixelated blob into a spectacularly complex and diverse world with water-ice mountains as high as the Rockies on Earth and exotic nitrogen-ice sheets with glacier-like flows. Charon has huge chasms bigger than Earth's Grand Canyon and a giant hood of dark material covering its north pole. New Horizons has shown Nix and Hydra to be highly elongated objects, covered in water ice, and with crater-like surface features. While New Horizons was busy investigating "resonant" objects in the Kuiper Belt, the European Space Agency's Rosetta mission has been conducting an historic rendezvous with one of the Kuiper Belt's "scattered" objects, comet 67P/Churyumov-Gerasimenko. Rosetta has been following the evolution of this "rubber duckie" comet for over a year as it moves through the inner Solar System. The Philae lander, with a sophisticated suite of instruments, was dropped down to the surface in early November 2014, only to bounce away when some of its landing gear failed to operate properly, until the craft finally settled precariously next to a cliff. In the meantime, the Rosetta orbiter spacecraft continues to acquire a wealth of data, most recently capturing the eruption of spectacular jets as 67P reached its closest approach to the Sun in early August 2015. 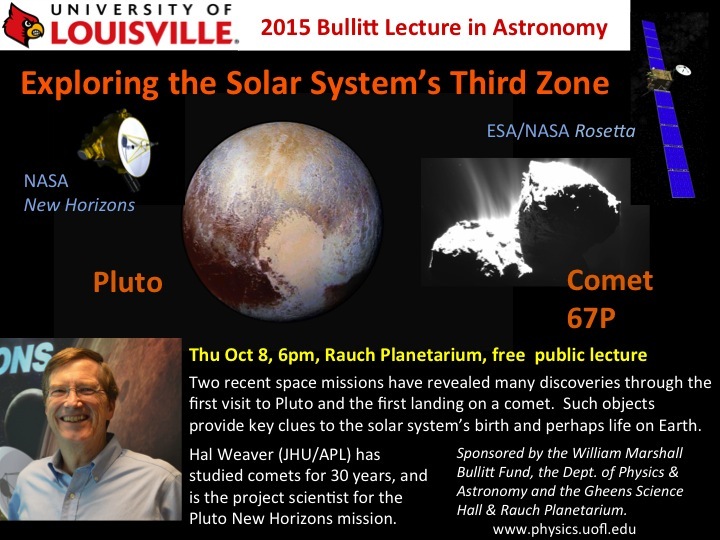 In this Bullitt Lecture, I will highlight the most exciting new results returned by the New Horizons and Rosetta missions. Hal Weaver, has been pursuing space-borne, rocket-borne, airborne, and ground-based investigations in planetary science since 1978. After earning his BS at Duke in 1975, he finished a PhD at Johns Hopkins Univ. (JHU) in 1982, where he analyzed cometary spectra obtained with the NASA/ESA International Ultraviolet Observer satellite. This was the first systematic investigation of cometary ultraviolet emissions and demonstrated that water was the dominant volatile constituent in cometary nuclei. In 1985-1986 he made infrared observations of Comet Halley from the NASA Kuiper Airborne Observatory, which resulted in the first unambiguous, direct detection of water in comets, and for which he was awarded the NASA Medal for Exceptional Scientific Achievement in 1988. Weaver led many investigations of comets using the Far Ultraviolet Spectroscopic Explorer and the NASA/ESA Hubble Space Telescope, including serving as the Chair of the science team investigating Comet D/Shoemaker-Levy 9 as it plunged into Jupiter's atmosphere in 1994. In 1996, asteroid 1984 FN was renamed to asteroid "Halweaver" in recognition of Weaver's work on the chemical composition of comets. Weaver joined the Senior Professional Staff at The JHU Applied Physics Laboratory in 2002, and is also a Research Professor at JHU. In 2007, he was appointed as a Co-Investigator on the Alice Ultraviolet Spectrograph, which is one of the principal NASA contributions to the ESA-led Rosetta comet mission. Hal Weaver is currently the Project Scientist on the New Horizons Mission, which is the first spacecraft mission to Pluto and the Kuiper belt. In 2005, he co-led a team that discovered two new satellites around Pluto (Nix and Hydra), and he was on the team that discovered two other small Pluto satellites (Kerberos and Styx) in 2011 and 2013. Weaver has published over 100 refereed papers, including studies of comets, planets, and satellites, and has a longstanding interest in the formation and evolution of planetary systems.